I have decided to start my Christmas cards early this year so I am not so rushed. Although it is hard to believe that I started this card a week ago! I thought that this pattern was perfect to go with the cute image. Threads are Mettler Polysheen 821, 3641, 376, 5643. The cute image is from Lili of the Valley which I bought already coloured. I have diecut around the image with Couture Creations Nesting dies and then added some "Waterfall" stickles around the edge. "Crystal" Glamour Dust to add a bit of sparkle. "Happy Christmas" stamp is also from Lili of the Valley which I diecut with Nellie Snellen MFD055, then slightly inked around the edge with Distress ink. 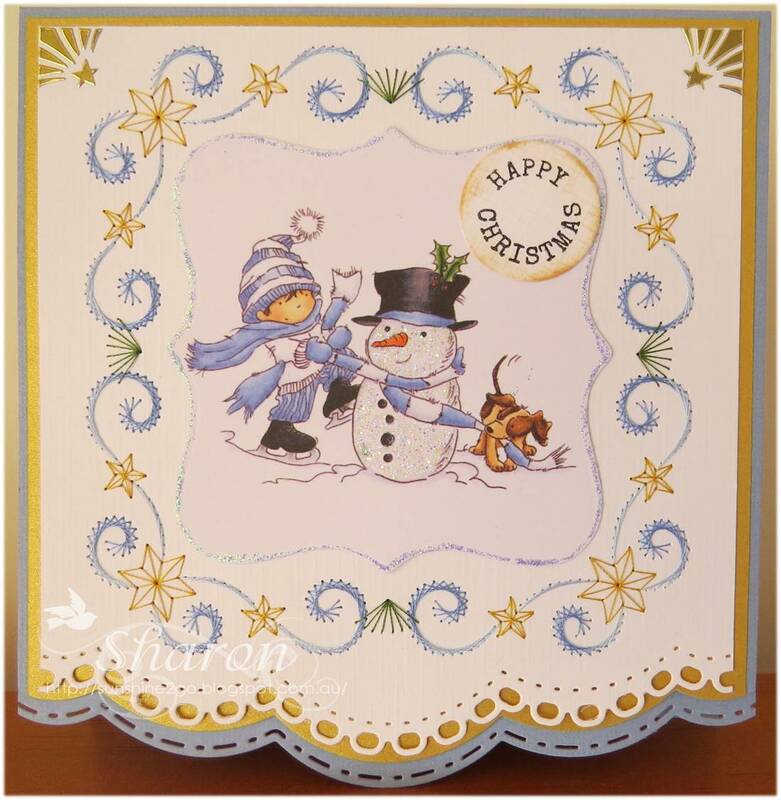 In the top corners I have used Starform Christmas stickers. Spellbinders Boardabilities S5-182 has made the perfect edge along the bottom of the card. It was fun creating my first Christmas card for 2013. August Challenge "Make it Festive"
Thank-you for coming by and looking. This month at Ann's Paper Art I made my exchange card for Lucy. 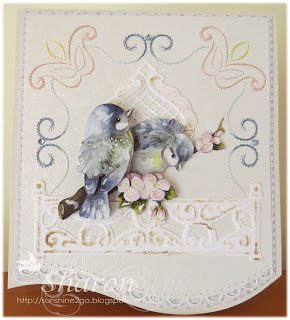 Once I started stitching this card I could not put it down until it was complete. The Threads are Mettler Polysheen, 1755, 6043. Scansilk 1840. Rice beads and small glass beads have also been stitched in the pattern. Before pricking out the pattern I die cut the circle with AND004 which is in the set of the new Stitching Stencils which are also available from the webshop. 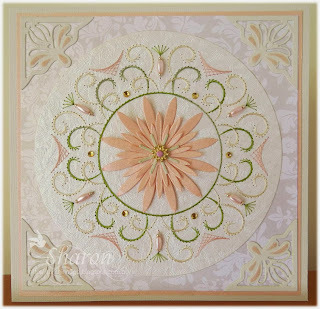 The Spellbinder, Delicate Asters HCD726 looks fantastic in the centre, although I have not used all of the elements. Leane Creatif corners have been coloured with Tim Holtz Distress inks. Nellie Snellen metal floral spaces with a small brad have been added to the centre of the flower. The cardstock is something that I picked up locally. Gems have also been added. I enjoyed making this card so very much and I hope that you also like it. Jackie is having a birthday this month and this is the card that I have created for her. Threads are Mettler Polysheen 741, 1755, 2166, 3853, 4071. 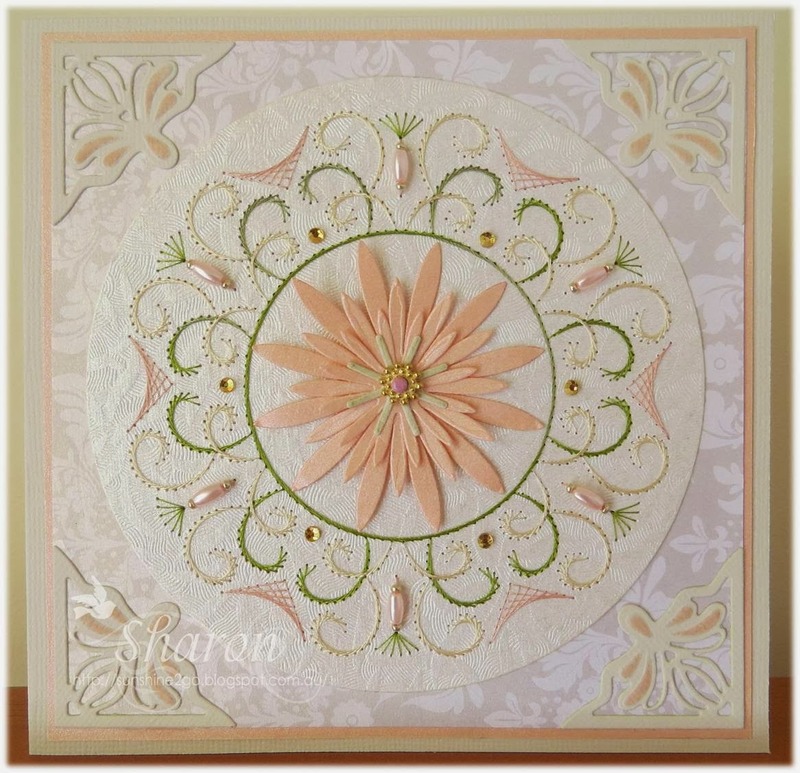 The background paper is from Forever Friends Kraft Notes. Blue jewels have also been added. I really enjoyed creating this card and I hope that you like it also.